Pens and pencils are one of the tools for learning. Imagine going to school without a pen or pencil at hand. Will you be able to remember everything that your teacher has said? I bet not! Writing has been an integral part of education. It records the lessons and the insights that we gained and allows us to practice what we have learned. When we were younger, we can never answer a simple arithmetic problem without writing it down. And we will never know the correct spelling of a word without writing it down. It is so basic indeed that sometimes, we take it and the tools for writing forgranted. The next time you buy very expensive pens, think of the little children whose pens are almost running out of ink. For every pencil you so carelessly lost, think of the children whose pencils are too short it makes writing very difficult. Help us help the needy children of Davao City and Samar learn better. Send us your unused pencils and pens and make a difference. It may be a small gesture but for them, it is something big. I believe that great things start from small beginnings. Your pens or pencils will really make a big difference! 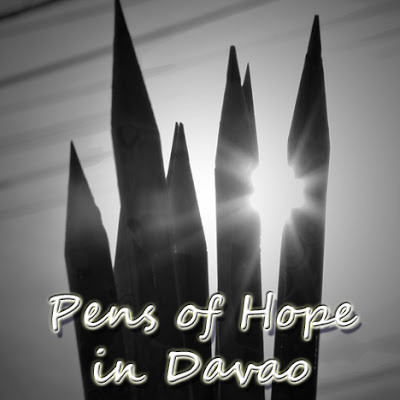 To learn more about this project, please visit Pens of Hope in Davao at Kikit Avenue or Pens of Hope in Samar at Nortehanon or by clicking the badges on my sidebar. You may also contact me at anak0430@gmail.com for more details.